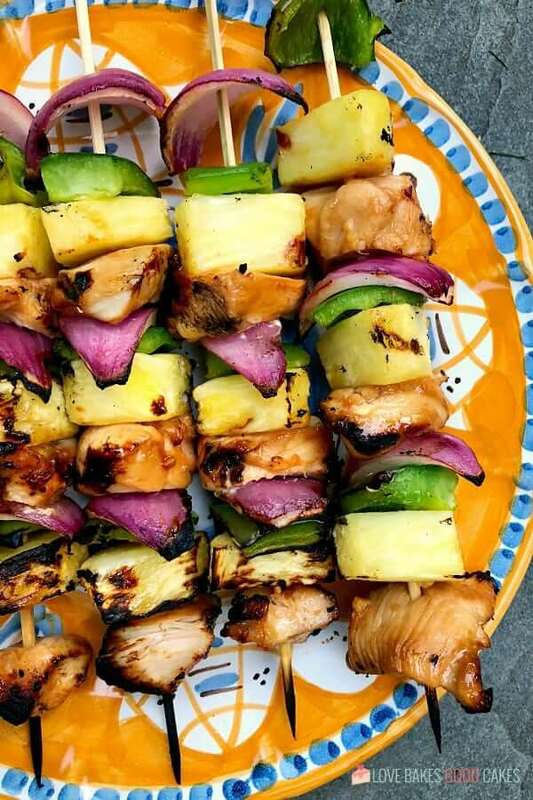 Take your taste buds on a tropical trip with these Hawaiian Chicken Kebabs. 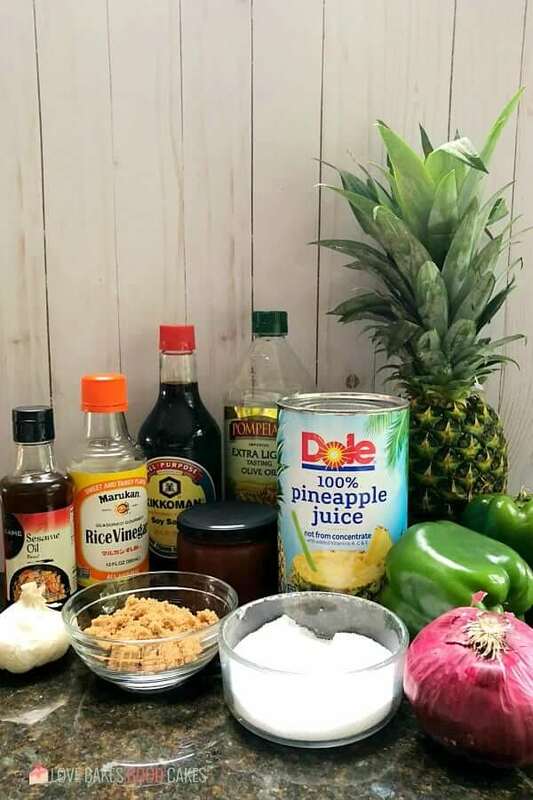 Marinated chicken combines with bell peppers, onions, and juicy pineapple for a delicious meal idea! You guys, I know summer is over. However, I really need to share these Hawaiian Chicken Kebabs with you! 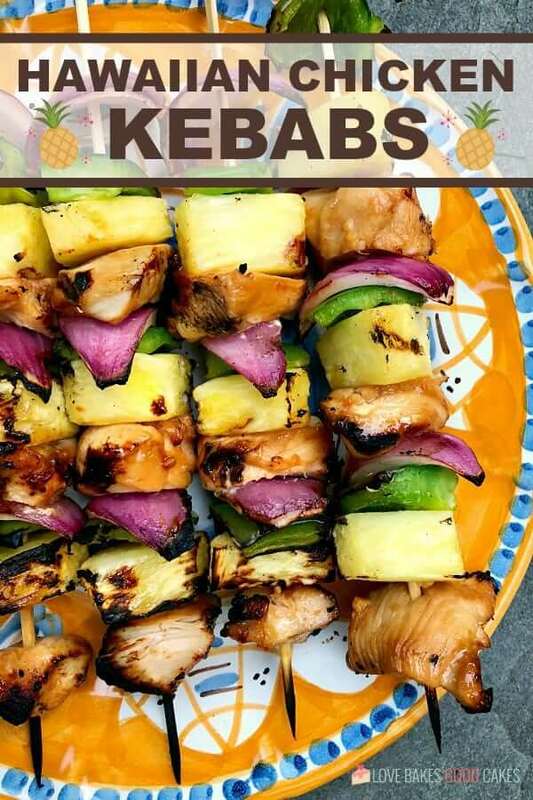 If you can’t use your grill to cook these kebabs, I’ve got you covered with a just-as-simple oven recipe! So make them. Soon! Living here in Phoenix, we use our grill a lot. But if I can be honest with you for a minute, there are times when it’s just too darn hot to be outside in the blazing heat – and I’d rather turn on my oven! 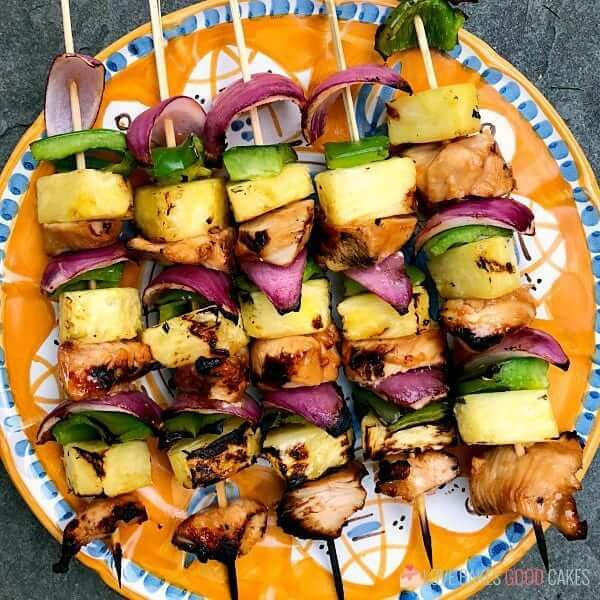 *gasp* That’s why I love recipes like these Hawaiian Chicken Kebabs – they are so easy and I can cook them on the grill or the oven! Both methods are easy – so use whichever one works best for your family! How do you make Hawaiian Chicken Kebabs? 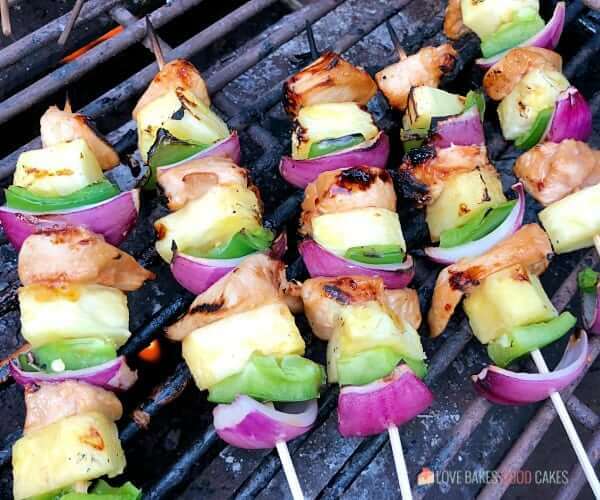 It is so easy to make Hawaiian Chicken Kabobs – and don’t just serve them in summer! 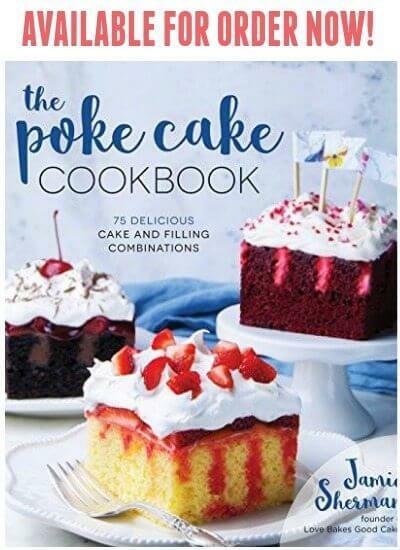 I’ve included instructions on how to bake them below! 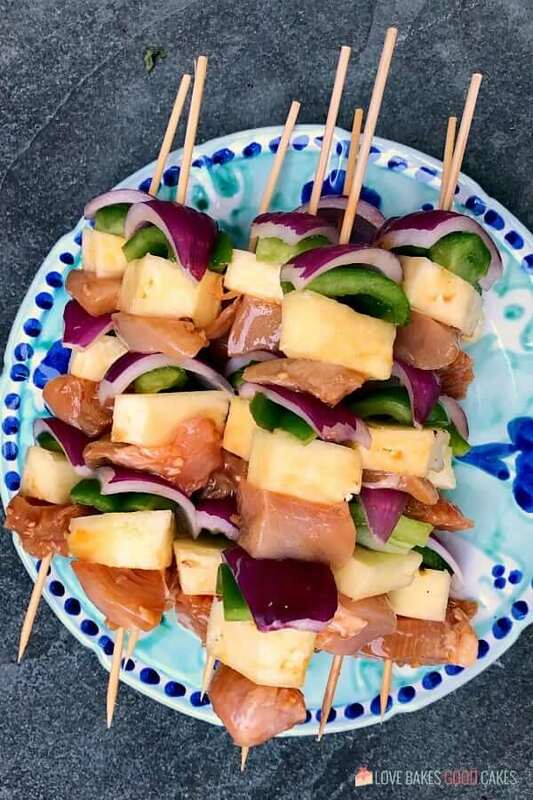 To make these Hawaiian Chicken Kebabs, you’ll need to start by marinating the chicken in a yummy blend of tropical flavor. I find it easiest to mix the marinade in a bowl, then pour it over the chicken. 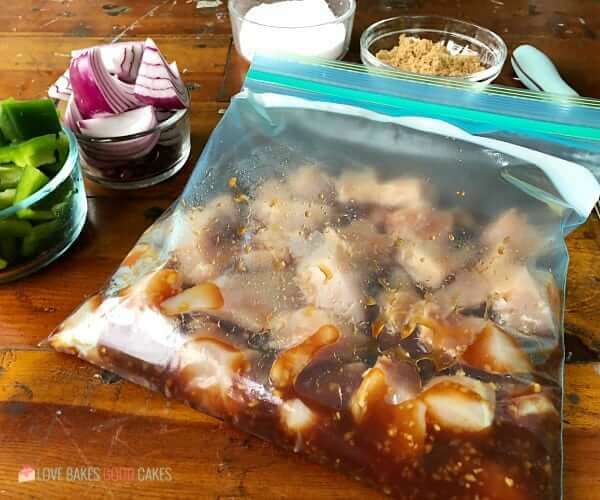 But if you’d like one less dirty dish, feel free to add everything to the zip-top bag, seal it, and give it a good mix with your hands before allowing it to marinade. While your chicken is marinating, you’ll want to soak your wooden skewers so they don’t burn! 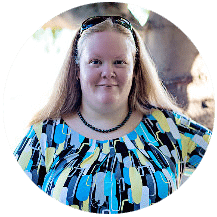 I usually use one of my 9×13-in. baking dishes with just enough water to cover the skewers. Give them at least 30 minutes to soak. Next, you’ll want to thread the chicken, bell peppers, onion, and pineapple alternately onto the wooden skewers. A few minutes on the grill (or your oven!) is all that’s left before you can chow down and enjoy the tropical taste of these easy Hawaiian Chicken Kebabs! Can you make Hawaiian Chicken Kebabs in the oven? To make Hawaiian Chicken Kebabs in the oven, you’ll marinate and assemble them just like mentioned above in the grilling instructions (and below in the recipe card). Instead of grilling them, you will put them on a lightly greased baking sheet. Pop them in a 450°F oven for 10 minutes. Carefully turn the kebabs over and continue to bake for an additional 10-15 minutes or until the chicken is no longer pink and the internal temperature reads 165°F. 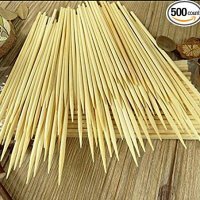 Can you put wooden skewers in the oven? Yes, you can! 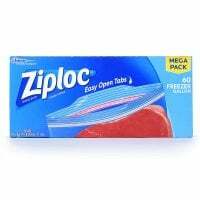 Just be sure to soak them in water for at least 30 minutes prior to use. over the chicken. Seal and refrigerate for 1 hour or overnight. Meanwhile, soak 12 skewers in water for at least 30 minutes to prevent burning. 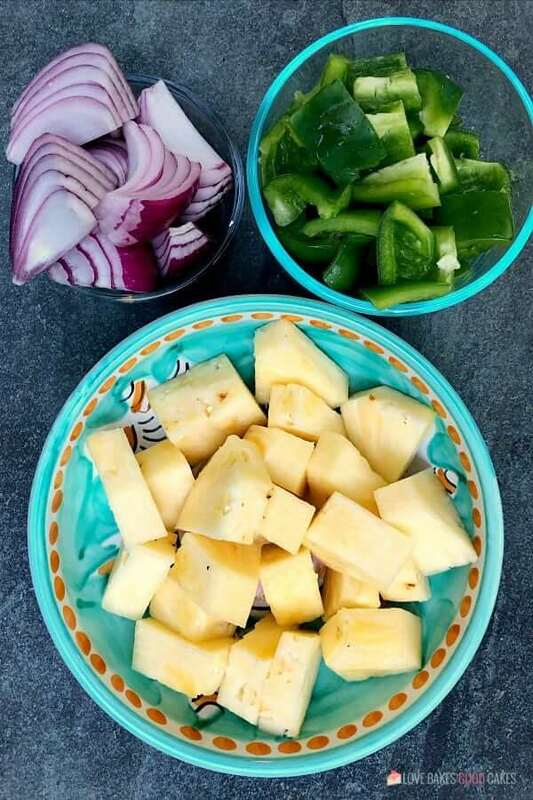 Thread bell pepper, red onion, pineapple, and chicken alternately 4-5 times per skewer. Grill over medium heat for 5 minutes, turn and cook for another 5 minutes or until an internal temperature of 165°F has been reached. These Hawaiian Chicken Kebabs can be made in the oven too! Preheat oven to 450°F. Lightly spray a baking sheet with non-stick cooking spray. Place the kebabs on the prepared baking sheet. Bake for 10 minutes. Carefully turn the kebabs over. Continue to bake for 10-15 minutes longer or until the chicken is no longer pink and the internal temperature reaches 165°F.